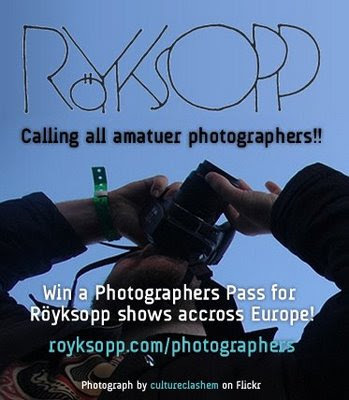 According to the blurb on the Royksopp website you need to send a link to your portfolio or Flickr profile to photographer@royksopp.com along with your full name and the show you would like to attend. The winner will receive a Photopass for themselves plus an extra ticket to take a friend to the show! Cha-Ching!!! A couple of summers ago, Royksopp played in the park next door to my house. Tickets sold out fast so we ended up listening for free in the comfort of our own back garden and very nice it was to. Their latest album 'Junior' is currently streaming in full on their website. My favourite song is 'Vision One' which I think utilizes the "balloon rubbing" sound well. They also have some nifty album artwork uploaded here.